I snapped my parking cable and I'm currently trying to replace it. It is the closest one to the front of the car, the one that attaches to the parking lever. Is there an easy way to replace this cable? I'm looking at the service manual Page P34, and there's a diagram that I attached. I removed the self locking nut. Went under the car, and it seems like the only way to remove it is remove the main cat/drive shaft? 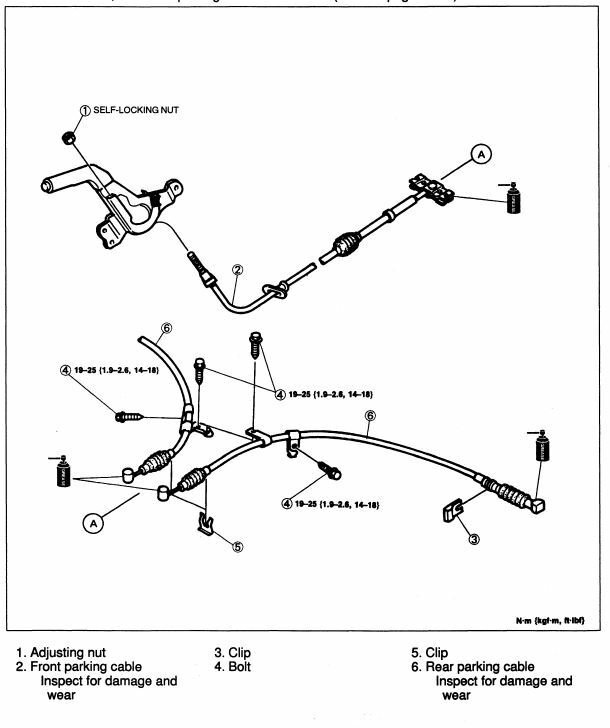 Additionally, do I have to loosen the 2 rear cables in order to release the attachment at part (A) of the diagram? Any tips or advice would be greatly appreciated. Thanks! You may be blazing your own trail there, the E-brake cables rarely fail. At minimum you will need to drop the main cat, might have to do the driveshaft and powerplant frame too. You'll have to get under there and see what needs to be done. ^Agree. IIRC, the pivot, part 'A' is attached to the top of the tunnel under the car. You will have to drop the PPF to access it, which means the main cat has to come off. You might be able to work around the driveshaft, but it's only four more bolts. Shouldn't be too bad to do. I'd be surprised if you had to drop the PPF. The pivot is attached as sgtblue states toward the rear end of the tunnel. There are also clips bolted to the top of the diff that will need removing. I replaced mine when putting the rear end back in, so cant really say what needs to be removed as it was all already out!